With summer comes lots of fun grilling and BBQ gatherings. We love to grill and often find ourselves grilling year round even when it’s freezing cold outside. We cook nearly everything on the grill. Our favorite is a good old-fashioned steak and potatoes. If you have a Roomba than you’d be a perfect match for the Grillbot with its hands-free cleaning. Ingenious! The perfect way to cook that bacon for those cheeseburgers without having to heat up the oven and your house. 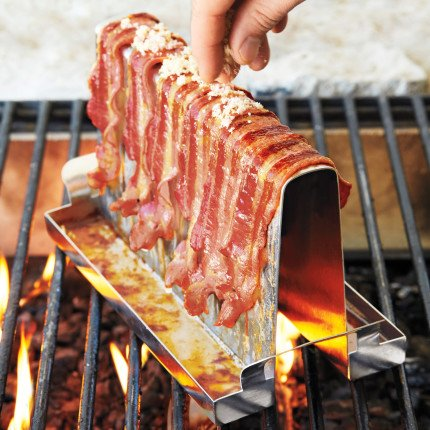 Hanging design ensures uniform heat distribution for perfectly browned, crispy bacon every time. Yes, you all know T-fal is one of my favorite brands in the kitchen. My favorite T-fal products: T-fal AirBake Natural cookie sheet set and the T-fal Fry Pan. Me gots to have them in the kitchen, especially that beyond amazing cookie sheet set. Who doesn’t need corn skewers? Besides being fun for your kids, they make gnawing on that corn cob a whole lot easier! I don’t do a lot of baster until turkey time but this little gadget is a must-have for any grill fanatic. I don’t know about you but I can never get my burgers perfectly round using my hands. This burger press is the perfect solution! Who doesn’t love a delicious grilled pizza? This is great for you to keep raw food separate from food you’ve cooked. This is a great way to prepare your food too. If you want to get real fancy shmancy you can put your name or logo on your steaks and food. Adds a fun and unique personal touch to grilled meats. Choose single, double or triple initials. What’s your favorite grilling tools and gadgets? Comment below and share with us!